Why grow thorns if they don’t work? « Nothing in Biology Makes Sense! Browsing pressure is very high in the savanna! Look a bit closer at an animal browsing a thorn tree and you’ll see it has one of two strategies – it bites the end of a branch off, wood, leaves, thorns and all (an activity we could call ‘pruning’), or it can nibble carefully among the thorns, picking the leaves out with care. And look closer still and you’ll see that most animals ‘pruning’ trees only eat the soft new tips, where the thorns haven’t hardened yet, which suggests that thorns do at least make it difficult for these animals, even if they still make their living from eating thorny bushes (I don’t think I’ve ever seen an impala eat anything that isn’t thorny!). So whilst thorns might slow animals down, it would still seem that thorny bushes are paying two prices – first they pay the cost of growing thorns in the first place, and secondly they still experience herbivory. Why, then, do they do it? The only way growing thorns makes sense (beyond the Genesis explanation that the land was cursed following the fall, of course), is in terms of an evolutionary arms race. Just as in the Cold War ‘the West’ and ‘the East’ were busy building costly weapons stockpiles with no obvious benefits beyond “they did it, so we have to as well”, we can think of plants and herbivores as being in a constant war. Plants trying not to get eaten, herbivores trying to eat plants. For every adaptation that a plant evolves in defence, before long the herbivores are likely to evolve a way around it (behavioural or morphological). Grow prickles and you’ll be well defended for a while, but then some animal will learn that eating new shoots whilst the prickles are soft is easy, grow thorns and before long something will evolve a long tongue that can lick the leaves out between the thorns, or a very narrow muzzle to squeeze between them. Once the process has started, there’s little obvious way to stop – nuclear disarmament treaties require both sides to sign up and trust one another, not something that’s common in nature. 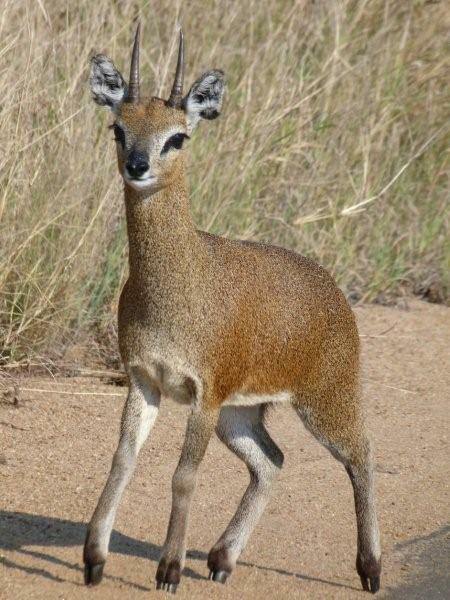 Klipspringer is just one of many medium-sized browsers in the savanna. 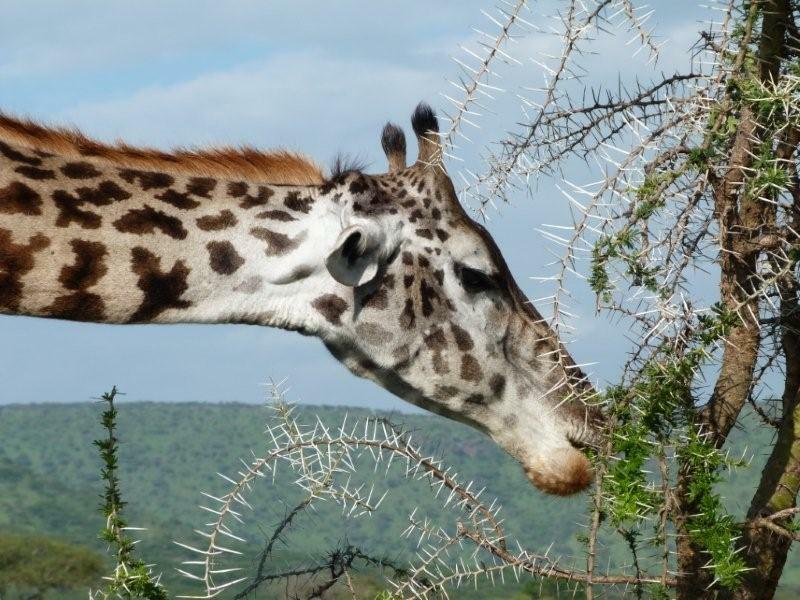 We can also see how it happens within the species: consider the first bush to evolve a few stiff stipules (the little bits where leaves join the plant stem) to make tiny thorns: there’d be one bush among many that was a bit prickly, and all the herbivores would avoid it, with many undefended plants to eat instead. So before long the genes that led to this mutation would spread and the whole population would have small prickles. Herbivores still need to eat, so with no choice now they’ll evolve a way to eat the prickly plant, or they’ll die. Then another bush has a mutation that makes those little prickles longer and now there’s one bush with spines among many with prickles. Again, the herbivores will eat the ones with little prickles, and the longer one has an evolutionary advantage. It’s easy to see how this process will rapidly run away until all plants have long, nasty thorns that cost them lots to grow, but still get eaten. This competition between the plants themselves can be seen as another evolutionary arms race, one we often call the Red Queen effect, after a character in Lewis Carroll‘s Through the Looking Glasswho said “it takes all the running you can do, to keep in the same place”. 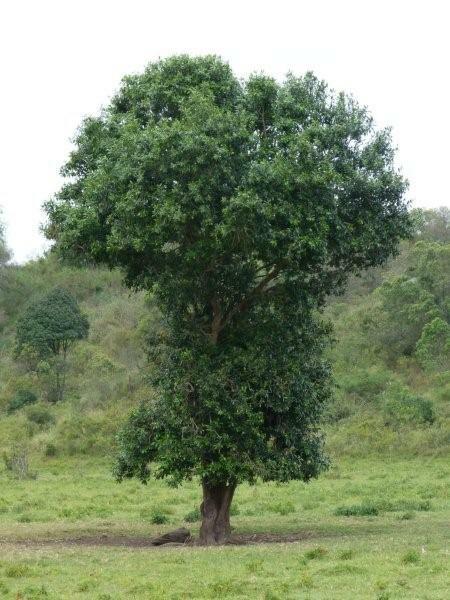 This Yellow-barked Acacia has grown masses of obvious thorns but is still stunted by browsing pressure. In fact, the defences provided by thorns are pretty sophisticated. As there’s a cost to being spinescent, it’s only sensible to grow thorns if the benefits outweigh the costs and where that happens depends on a number of things above and beyond simply the density of herbivores: it’s the actual cost of that herbivory that matters. Herbivory is more costly in places where you can’t grow much to replace what’s eaten, so it makes sense that in the driest environments thorns are more valuable than in wetter places where new growth can rapidly replace lost material. Exactly what has been found for Vachellia tortilis in experiments in Israel. Using the same logic, you might expect that if you give fertiliser to a growing tree it will also be able to grow faster so will invest less in thorns. But sadly, when that experiment was done on the same species, it didn’t hold out—more fertiliser meant more thorns, which the authors of that study took to mean that the ability to grow thorns is nutrient limited. Now I suspect their side note that trees (even of the same species) growing on nutrient rich soils often have more thorns than those on poorer soils is more relevant here—if you’re packed full of nutrients you’re probably a much better target for herbivory than if you’re not, so although fertiliser means you can grow faster, it also means you’ll face higher herbivory rates. Which in turn means if you grown on rich soils you’ll face higher costs and would be wise to invest more in defence.What’s more, it makes sense for plants to be able to sense the amount of herbivory they’re facing and only grow thorns when herbivory is high: again, exactly what’s seen in experiments. 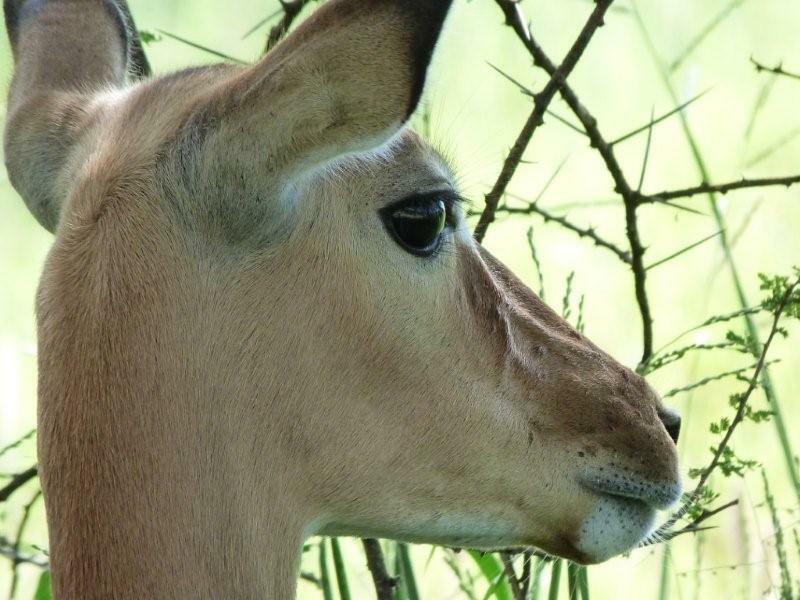 Impala often have the largest browsing impact in the savanna. Similarly, if you’re going to pay the costs of being thorny, it’s worth making that immediately obvious to potential herbivores to ensure that they avoid you rather than taking a few bites before making the discovery. So instead of hiding your thorns, why not make them obviously white or even red as a warning? And just as well defended insects are often bright and obvious (we say they’re aposematic), many thorns are also aposematic. But where it gets really scary is recent work suggesting that thorns not only provide direct defence, but are actually used as needles to inject bacteria and fungi into whatever brushes against them. There’s evidence to suggest the plants have evolved such that the thorns are particularly good at making homes to some pretty nasty beasties: Clostriduim botulinum, Bacillus anthracis (I’m sure you can guess what those two give you) and many other nasties are reported to be happy living on thorns. What’s more, those nasties are happier and therefore in higher densities on the thorns than the photosynthetic green parts of the plants, suggesting the plants really have evolved thorns that are really hypodermic needles. Truly plant biological warfare! No wonder that tiny thorn scratch can go nasty on you. 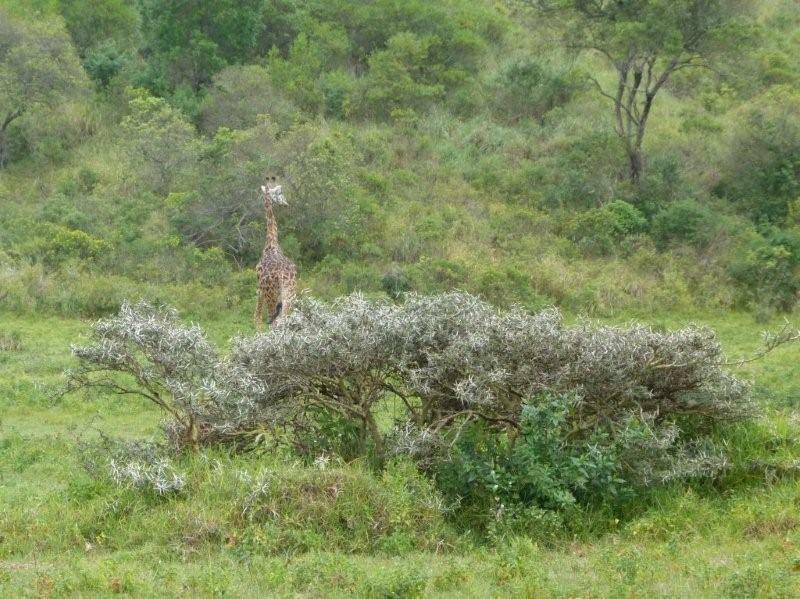 So, to summarise, African savanna is thorny because of all the animals, just as we first thought, but hopefully we’ve learnt something interesting in the longer answer: even if it is only to pack the disinfectant when going on a walking safari! This entry was posted in coevolution, ecology, herbivory and tagged browsing, coevolutionary arms race, grazing, thorns. Mr. Beale, I owe you a debt of gratitude. Your post has resolved something that has bothered me since I took English in the 10th grade and read Hemingway’s “The Snows of Kilimanjaro”, in which the narrator dies of a gangrenous wound received from a thorn in east Africa. As a kid who spent virtually every day being sliced open by thorns while crashing around woods in western New York, I found this to be irritatingly absurd. Now that I know these thorns are virtual cesspools of virulent microorganisms, my mind is at ease. Thank you.